This is one of those pretty easy recipe to make. You have an option to use either ground beef or pork or chicken. 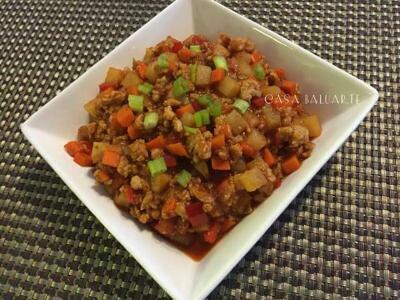 Other's call this Picadillo or Giniling Sarciado. I simply call this yummy! Saute garlic and onion in cooking oil till caramelized. Add ground chicken and saute till it turns golden brown. Add water and simmer in low heat till water is almost gone. 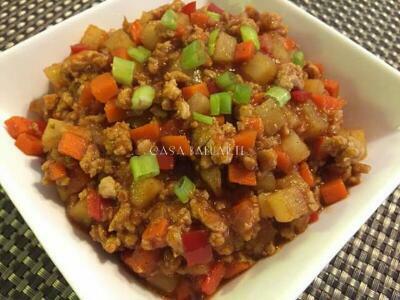 Add carrots, potatoes, raisins and bell pepper. Stir well for 2 minutes allowing the vegetables to cook. Season with salt, ground pepper and some sugar (optional) to taste. Add tomato sauce, stir well and simmer in low heat for 3-5 minutes.